Posted on 28th March 2018 by William T.
Sarens used 11 cranes to install 274m gas pipes in Belgium. 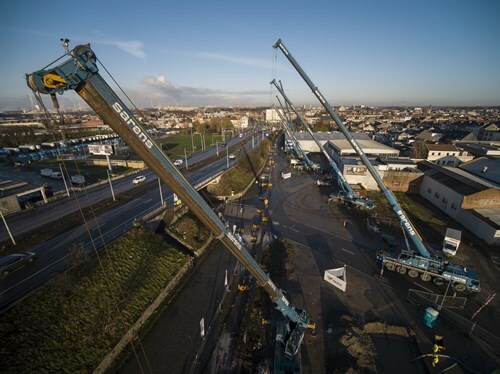 Sarens used 11 cranes to install 274m gas pipes in Belgium. In the city of Merksem (Belgium), a team of Sarens has recently worked on the construction of a tunnel for a pipeline downstream of the Albert Canal. In the city of Merksem (Belgium), a team of Sarens has recently worked on the construction of a tunnel for a pipeline downstream of the Albert Canal. The customer van den Berg / Besix had charged Sarens to install along 274m of gas pipe in the well. This required 9 telescopic cranes Sarens (with capacities between 40 and 100 t) and 2 cranes of the customer associated with meticulous execution on the ground. The cranes worked together to simultaneously lift and hold the pipe. The pilots worked without visual contact and were guided by the lift supervisor. Then, the load was inserted into the well at a precise angle and pulled through the tunnel through mechanisms on the other side of the Albert Canal. The team was able to succeed with the challenges of low visibility and in confined working conditions. “We are very satisfied with this cooperation (…) The result is very good.” Says Maarten Pombreu, Business Line Manager Horizontal Directional Drilling at Van den Berg/ Besix.